Surprise a partner, friend, family member or colleague with a Houlihans Online Gift Voucher. Simply add in the amount of the voucher, add to cart and then checkout. Houlihans Gift Voucher will be emailed directly to the recipients email. Vouchers purchased online can only be redeemed for online purchases. Alternatively you can purchase a hard copy voucher instore which can be redeemed for instore purchases. 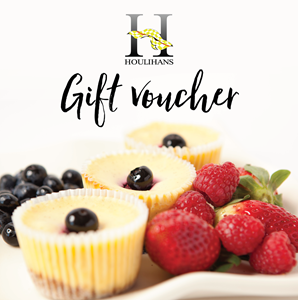 Spoil a partner, friend, family member or colleague with a Houlihans Online Store Gift Voucher of your desired amount. Simply add in the amount of the voucher, add to cart and then checkout. Houlihans Gift Voucher codes will be emailed directly to the email address entered at checkout.